The stop watch is your friend, when it comes to HIIT optimization. After the examples selected examples in the previous installment the intention of this 2nd part of the serious is to find some more general rules of HIIT program optimization with a special focus on exercise and performance on the one hand and fat loss and improvements in body composition on the other hand. Now, if you want to optimize something, you often have one or a set of parameters you can plug into a system of linear equations to find those parameters which generate the maximal output. "[...] the optimal exercise intensity, exercise duration and number of interval bouts, in addition to the type (active vs passive) and duration of the recovery between exercise bouts." In essence, although more than 10 years have passed since the publication of this paper and the number of pertinent studies has increased, we are still (and will probably always be) at a loss when it comes to identify a single best HIIT protocol that will yield optimal results for everyone. How do we define intensity? Your exercise selection should mirror the demands of the sport you are training for. Anyone competing in one of the classic team sports, will probably benefit most from sprints (either outside or on the treadmill). A cyclist will use the bicycle and a rower the rowing machine. Don't use equipment where you have to tweak the resistance not the speed (e.g. many of the old crosstrainers) to increase the intensity. HIIT is supposed to be fast and thus hard, not hard and thus slow! Now, let's be honest. How many of you know their VO2max? Or the time and speed at which you get there? If we simply assume that V_max is about 90% of what you would call "all-out" it does yet appear that the T_max value was one of the better ways to prescribe the training intensity during high intensity interval training (cf. Billat. 1998). Since there is no clearcut relation between VO2Max, V_max and T_max (25% inter-individual variation of T_max in athletes with identical VO2max), anyways, this appears to be the most reasonable and practical approach - also because measuring 60% of T_max (assuming we approximate it as the time at 90% of all out) requires nothing but a stop watch and can be repeated on a monthly basis to adapt the training intensity. According to studies by Billat et al. and Smith et al. (Billat. 1999, Smith. 2003) sprints lasting 50% (1:1 work to rest ratio) and 60% (1:2 work to rest ratio) of the T_max are not just sufficient, but according to Smith et al. even superior to intervals with a length of 70% of the T_max and 1:2 work to rest ratios. Although both studies were conducted in highly trained individuals, it is likely that the T_max, which is propably way lower for recreationally active, let alone sedentary individuals, provides an appropriate gauge for "optimal" training intensities in this subgroup as well. After all, this would mean that trained athletes require longer interval durations to further augment their performance than Joe Average. And in fact, the currently available research appears to confirm this, while evidence from HIIT studies in trained cyclists suggests that the same HIIT protocols in the 5s-60s range at 80-90% of all-out performance are probably insufficient to induce further performance increases in already trained subjects (see table 1, rows marked red), unless the intensity is upped to supramaximal levels (see table 1, last row). A T_max based exercise prescription with interval lengths of 50-60% (not more) of T_max, would probably mirror these increases in "optimal" interval length from non-trained over recreationally trained to elite athletes and could therefore provide a more accurate way of planning your HIIT sessions than picking a fixed work and rest duration. Let's assume you could go for just 2 min at a 80% pace of what you perceive as all-out. You would end up at a 1min interval duration, while your body, a highly trained sprinter can maintain the very same intensity for 5 minutes will have to go for intervals of 2.5min. For both an interval to rest ratio of 1:2 seems to be a happy medium, at very short submaximal intensities (in this case 80%). 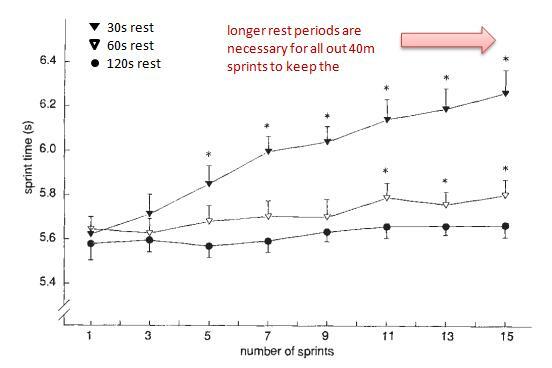 As the data in figure 1 goes to show, the rest requirements can be profoundly increased for all-out 40m sprints with 60s rest after a 5.6-5.7s sprint equaling a sprint interval to rest ratio of 1:11 in "seven moderately to well-trained highly motivated male physical education students" (Balsom. 1992). The same 1:2 rule that applied to the T_max 50-60% workouts will thus maybe fail you, when you are going faster / more intense. In this context you may also argue that rest times below 60s - just as it is the case with strength training - must be regarded as an intensity technique that's actually supposed to increase the overload on the musculature by cutting rest in-between sets. Moreover, the increased lactate during active recovery phases has repeatedly been shown to be advantageous in terms of both lower lactate accumulation and an increased likelihood of actually achieving VO2max and thus eliciting a strong enough training stimulus to trigger an adaptive response (see review in Billat. 2001; 22-23). Can you combine intervals with a strength training routine? Now, I would assume that most of you are no endurance athletes. So the aforementioned studies, which either were HIIT stand-alone studies or - in the case of the trained athletes - studies in which the participants replaced 1-2 of their regular aerobic exercise training with HIIT training do not answer the still highly debated question whether you can or cannot do both HIIT and strength training. I have already pointed out in previous posts that doing so on separate days doesn't seem to be a problem. However, if you "HIIT it" on the day you would usually do say chest and back. You would obviously have (a) the time and (b) the regenerative capacity to add another workout day to your week if you did not want to switch from a 3- to a 2-day split. Against that background, I was not really surprised that DoesObamaEvenLift mentioned a pertinent paper by researchers from the University of Sao Paulo in his (or her?) comment beneath the first installment of this series. In this particular study (de Souza. 2012), the researchers wanted elucidate if the combination of HIIT + hypertrophy oriented strength training would hamper the benefits of one or another and whether the molecular adaptations would explain the differential effects on conditioning, strength and body composition of 43 active male physical education students who did not engage in any regular strength and aerobic power/capacity training within the last 6 months. The good news for all muscle heads: Despite the differences in molecular adaptations between training regimens, 8 weeks of concomitant training (CT), i.e. the combination of interval training and lifting on one day did not blunt muscle strength and hypertrophy increments when compared with strength training (ST; 8-12RM for a total of leg-press 45 °, knee extension and knee flexion with 90-120s rest between sets) alone. The bad news is however that this protocol has little to do with the workout regimen of the average gymrat, who trains on 3x or more days per week and doesn't do "leg days" (without squats) on each of those days. So, while it cannot be said whether muscle or strength gains would be hampered in the long run, the way the scientists tweaked the interval part of the workout from week 1 to week 8 by slowly increasing the running speed 80-100% of the speed at which they had been running in the previous test to achieve VO2max, while increasing the rest between sets and accommodating for the additional strain of going at 95%-100% by cutting back the volume (see figure 2 left) stands in line with what has been said about the complex relation of these parameters in the previous paragraphs. If your goal is to actually increase your conditioning and VO2max a carefully planned progression is an absolute must. To to so it would appear reasonable to re-test the initially discussed T_max after 6-8 weeks in the course of which you would progress from 80% to 95-100% in a way similar to what the participants in the study did. Based on the change in T_max you would then increase the length of the intervals appropriately while keeping the rest times similar. If your T_max for example had gone up by ~20% during the last cycle, you would start your 2nd cycle with 72s intervals at 80% with the same progression you have used before. Previous studies have shown that a very brief interval training, even when it's performed on an empty stomach, like first thing in the morning or on an intermittent fast is not catabolic, but will in fact increase protein synthesis by 43% in men and 122% in women (read more). When you go through these studies you will realize that it's impossible to identify the single-best HIIT workout for fat loss, what appears to be clear though, is that fat loss workouts do not require the same long intervals athletes with an already high VO2max need to promote their conditioning. While the longer intervals may in the end burn more energy, the previously mentioned increase in lactate suggests that the additional energy expenditure in the course of the workout (a) does not come from your fat stores and (b) could take its toll, when you are dieting. Against that background, an "optimal" HIIT fat loss routine will probably be characterized by shorter, highly intense sprints and longer active recovery between the sets, with the latter giving your ramped up metabolism time to tap into the fat reserves, get rid of the lactate and ready for the next HIIT stimulus. A similar rationale is actually behind the idea of combining HIIT and aerobic exercises in a single fat loss workout that consists of an initial HIIT part of 3-5 intervals at 90-95% of what you could be sprinting for 30-45s interspersed by 2-3 minutes of active recovery followed by 15-20min of light intensity steady state of an intensity that would equal walking or very light jogging on a treadmill. With a total workout duration of ~30-45min this should yet be done on a day of it's own. A viable alternative for everyone who doesn't want to give up on their current strength training routine and doesn't have room for another training day would be to alternate between the shorter varieties of the HIIT part and the LISS part of the aforementioned workout as an adjunct to a short, but intense resistance training regimen (30-40min total with no more than 18-20 sets). How to progress when you are dieting? As obligatory as a progression in intensity and duration of the intervals may be for someone who's trying to increase his or her conditioning and VO2max, it is nothing I would suggest on a diet. Unless you are trying to progress from overweight or obese to normal and are in real bad shape, it is not exactly likely that your performance will be increasing to an extend that will require adaptations. That said, it is not necessary and in most cases counterproductive to increase the workload, when what you would actually have to do to drop body fat is to reduce your energy intake. Have patience and simply stop dieting, when your progress stalls for 2 weeks (sometimes even an additional refeed can reignite the weight loss). Can HIIT help me make lean(er) gains? Personally, I have had greater success with very light steady state cardio like walking on an inclined treadmill either in the morning or after a strength workout, but if you take a look at the aforementioned SuppVersity post about increase protein synthesis (see image with sprinting guy and girl next to the list of examples), or take both the results of the Psilander study that was on the news in October 2012 and the latest revelations about PGC-1 A4 and how it may benefit from pre-workout glycogen depletion, a short but intense HIIT training right before your workout may not only help you to stay lean, but could actually improve your progress - assuming you don't end up seriously overtrained and are willing to eat enough. Are there any supplements that can help? Aside from the regular fat loss adjuvants, a combination of creatine, caffeine and amino acids, as it was used in a 2010 study by Smith et al. would be a basic stack to increase your HIIT and overall workout performance and thus augment body fat loss. If you use BCAAs this would also make a good addition to any fasted HIIT regimen in the morning for those of you who follow an intermittent fasting protocol. Also, the addition of baking soda, may be worth trying, because the increased alkalinity with concomitantly increased workout intensities could provide both metabolic (=lower propensity to gain fat) and performance (=increased growth stimulus) advantages. Too many stimulants or stim-laden fat burners, on the other hand, are probably rather counterproductive. Their ability to free fat from the adipose tissue is of no avail, when you are "bulking" - in the worst case it may even repartition the fat from the periphery to the trunk. So you better tick to one serving of stims before a workout. Don't get overtly focused on HIIT there are benefits to steady state exercise, as well; and it goes without saying that you won't be willing to give up weight lifting completely. You can better live without HIIT and just lifting + LISS than with HIIT only. If you want to improve your conditioning, you will have to train on the higher end of the 15s to 4min interval continuum. If you want to improve your body composition, training at the lower end of the 15s to 4 min interval continuum and combining shorter HIIT workouts with either strength or aerobic work appear to be more promising. Stick to the same intense, but short HIIT regimen, when you are dieting in order not to fall victim to the "doing more and eating less downward spiral". Know your limits and don't simply add hours of HIIT to your current regimen. Based on these rules of thumbs and the rest of the information in this installment, as well as the examples in the previous installment you should actually be able to come up with some kind of workout you believe you can benefit from. Give it a two week trial before you decide whether it's too hard, too easy or whatever and don't expect magic results. In the end, HIIT is like a potent supplement: Those who have what it takes to make progress without it will benefit. Those who have stalled on each and every regimen they tried, will stall on hit as well (most likely because they overtrain and/or follow a crappy diet). 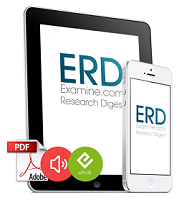 Balsom PD, Seger JY, Sjödin B, Ekblom B. Maximal-intensity intermittent exercise: effect of recovery duration. Int J Sports Med. 1992 Oct;13(7):528-33. Billat V, Binsse V, Petit B, Koralsztein JP. High level runners are able to maintain a VO2 steady-state below VO2max in an all-out run over their critical velocity. Arch Physiol Biochem. 1998 Feb;106(1):38-45. Billat VL, Flechet B, Petit B, Muriaux G, Koralsztein JP. Interval training at VO2max: effects on aerobic performance and overtraining markers. Med Sci Sports Exerc. 1999 Jan;31(1):156-63. Billat LV. Interval training for performance: a scientific and empirical practice. Special recommendations for middle- and long-distance running. Part I: aerobic interval training. Sports Med. 2001;31(1):13-31.
de Souza EO, Tricoli V, Roschel H, Brum PC, Bacurau AV, Ferreira JC, Aoki MS, Neves-Jr M, Aihara AY, da Rocha Correa Fernandes A, Ugrinowitsch C. Molecular Adaptations to Concurrent Training. Int J Sports Med. 2012 Oct 8. Gunnarsson TP, Bangsbo J. The 10-20-30 training concept improves performance and health profile in moderately trained runners. J Appl Physiol. 2012a Jul;113(1):16-24. Gunnarsson TP, Christensen PM, Holse K, Christiansen D, Bangsbo J. Effect of additional speed endurance training on performance and muscle adaptations. Med Sci Sports Exerc. 2012b Oct;44(10):1942-8. Laursen PB, Jenkins DG. The scientific basis for high-intensity interval training: optimising training programmes and maximising performance in highly trained endurance athletes. Sports Med. 2002a;32(1):53-73. Laursen PB, Blanchard MA, Jenkins DG. Acute high-intensity interval training improves Tvent and peak power output in highly trained males. Can J Appl Physiol. 2002b Aug;27(4):336-48. Lindsay FH, Hawley JA, Myburgh KH, Schomer HH, Noakes TD, Dennis SC. Improved athletic performance in highly trained cyclists after interval training. Med Sci Sports Exerc. 1996 Nov;28(11):1427-34. Smith AE, Fukuda DH, Kendall KL, Stout JR. The effects of a pre-workout supplement containing caffeine, creatine, and amino acids during three weeks of high-intensity exercise on aerobic and anaerobic performance. J Int Soc Sports Nutr. 2010 Feb 15;7:10. Stepto NK, Hawley JA, Dennis SC, Hopkins WG. Effects of different interval-training programs on cycling time-trial performance. Med Sci Sports Exerc. 1999 May;31(5):736-41. Stepto NK, Martin DT, Fallon KE, Hawley JA. Metabolic demands of intense aerobic interval training in competitive cyclists. Med Sci Sports Exerc. 2001 Feb;33(2):303-10. Westgarth-Taylor C, Hawley JA, Rickard S, Myburgh KH, Noakes TD, Dennis SC. Metabolic and performance adaptations to interval training in endurance-trained cyclists. Eur J Appl Physiol Occup Physiol. 1997;75(4):298-304. Weston AR, Myburgh KH, Lindsay FH, Dennis SC, Noakes TD, Hawley JA. Skeletal muscle buffering capacity and endurance performance after high-intensity interval training by well-trained cyclists. Eur J Appl Physiol Occup Physiol. 1997;75(1):7-13.